Occasionally we hear back from people who have been pleased by our work. 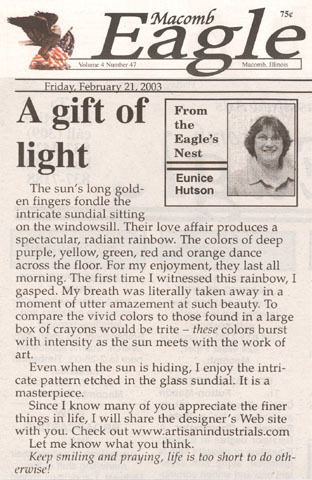 Here are some of the inspired comments and reviews that we have been receiving about the Spectra Sundial. "The Spectra is stunning Jim, I cannot put into words how pleased I am, it's absolutely breath-taking. She will be absolutely overjoyed when she sees it!" "My parents LOVE the sundial and it was finally sunny enough on Sunday to see it in action - it works perfectly for the location I scoped out. Thanks again for your craftsmanship and for making our timeline work!" "Hi Jim! I am very happy to inform that we have received the package yesterday, and I must say we couldn't stop admiring the sundial and the workmanship! Yes, we have some questions, but we'll first try to go through the instruction manual. The packaging was also very neat and secure; thank you very much!" "Hi Jim! Well, it arrived safely the other day and it is absolutely gorgeous! We're so happy with it. And, as a bonus, we finally got some sun so that we could test it out! Thanks again. It is beautiful and the craftsmanship is awesome!" "Hi Jim, I think it looks AWESOME!! Thank you for your happy anniversary wishes, as well as for the beautiful sundial! We are just thrilled with it. I didn't realize how interesting it would be to watch it measure the time of year, as well as the time of day. It's so striking how quickly that shadow length changes!" "Hi Jim, I just wanted to let you know that the sundial arrived safe and sound today and without any customs problems. I've had a sneaky look and am thrilled with the Spectra. I'm sure my husband will love it too. I will try and send you a photo after the birthday and when it is all set up. Thank you so much for your excellent service and attention to detail which has been faultless from start to finish." "I wanted to thank you very much for the amazing job you did on our Spectra sundial. Everyone really loved it! Your skill is perfect sir! Let me know where I can leave a message for future clients to know how great you are to work with and the sundials you create." "My husband and I wanted to reach out to you and let you know that we love our sundial and we thank you for all of your time and effort putting it together. We are honored to be a part of the exclusive club of Spectra owners, and we love to see the beautiful rainbow the sundial casts in our room every morning. It is the focal point of that room and all of our friends and family have complimented us on it. We definitely share our love for our sundial with our family and friends and highly recommend your great work! It was such a special 1 year wedding anniversary gift from my family and we will treasure it forever." "Hi Jim, I'm not sure if you will remember me but I just wanted to write and tell you that my husband and I have really been enjoying the Spectra sundial that you made for our anniversary. We have had it for about 6 years now and I must say that it is so accurate that it is amazing - it has "hit the mark" as you said it would every year on our anniversary since we have had it in our house. The rainbows every day are amazing too, and I thought you might like to know that I have been telling all my friends about our sundial too. I'm a blogger and whenever I do a story about wedding gifts or the perfect anniversary gift I always mention your work, and I make comments online as well. Thank you so much for our wonderful Spectra sundial, it has become a real touchstone in our home!" "Thank you so much Jim. We received the sundial about 20 minutes ago and my husband is blown away. It was well worth the wait. It's raining here today but we're anxious to see the rainbow once the sun comes out!" "The sundial arrived at my place on our anniversary just like clockwork - perfect timing. Thank you so much for working me into your schedule. We are both in love with it. Your attention to detail sets this apart from any I've ever seen. We are both blown away. Thank you so much again and rest assured I will tell anyone I show it to how wonderful you are to work with. We will never forget our first anniversary and it's thanks to you." "We received the sundial yesterday just as you promised, and it was such a wonderful gift, thank you! My husband loves it and I know it will be sitting in the sun in his office for the rest of our lives together. Your text and talent are much appreciated here, and we will absolutely be mentioning you and your sundials at any opportunity." "We received our Spectra and we absolutely love it! The etching and detail is wonderful, and worth the wait. We couldn't imagine a better, and more timeless, way to commemorate our first wedding anniversary." "I am sure that my wife and I will enjoy seeing our Spectra for decades to come. Queensland is known as the Sunshine State and I am sure our sundial will look spectacular during our brilliant sunny days. I am sure it will become a talking point for our friends and I will be pleased to mention it to others." "Thank you again for rushing my clock and making it in time. It was a huge success. My wife said 'I think this is the most thoughtful gift anyone has ever given me.' Thank you again for making this so special. A truly unique and beautiful gift." "As soon as it arrived I tested your sundial and - of course - it works perfect! The sundial is a very good-looking colorful lady. Thank you for this beautiful sundial. Thank you for all your work. Not only your dials are perfect, your site is perfect too. You are really very clever in many areas. I really did not expect, that you make the Spectra Sundials all alone, without any help of other people. Compliments and congratulations!" "I just received the Spectra this morning and it is gorgeous!!! I was so excited that I gave it to my wife early. She absolutely loves it. I also posted a good review on the site where I got the idea. I will definitely tell my friends about your amazing product, and thank you again from an extremely happy customer." "The sundial has arrived and it's so beautiful! I don't know how it works exactly but I'm gonna figure it out, and he is going to love it! "Our Spectra arrived perfectly on time for our anniversary and was a huge hit with my wife. Thank you again for making it for me. We set it up in our front window in time to catch the sunrise Sunday morning and after a few adjustments it works perfectly!" "We received our Spectra dial the other day. It is amazing. My wife and I love it! Seeing photos of them on your site is great but when you see it up close, the detail is amazing! We appreciate the effort you put in to create this special dial for us. Thank you for the constant communication as well. We will definitely help spread the word and let our friends and family know. I am sure it will become a conversation piece when they all begin to see it." "Your service throughout this process has been fantastic. We will definitely recommend Spectra and send you any pics we take of the rainbows along the way." I really do appreciate it. More importantly, the sundial is beautiful. It's very cool and I believe it was a hit!" "Jim you did a miracle, and landed the sundial on our doorstep on the day of our anniversary. I did not think that was possible!" "Thank you so much for all you've done in making this beautiful sundial. It arrived on Friday as planned and I must say it is stunning. My wife is very impressed with it as well. It compliments the room beautifully! Once again I can't thank you enough for "bumping" us up in line to complete production by our anniversary. The way you treat your customers is nothing short of exceptional. I've told all my friends and colleagues just how happy I am with you and your company. Keep up the great work!" "I just wanted to say thank you for the sundial. It arrived on Christmas Eve so was a lovely early Christmas present for my husband. On Christmas morning, the sun dutifully made an appearance (a rarity on Christmas Day in the UK!) and we had fabulous rainbows lighting up our kitchen. It couldn't have been more perfect. It is a beautiful product and myself and my husband are both very pleased with it and will treasure it for many years. I'd also like to say that your service has been impeccable. You have been very attentive and professional and delivered the personal touch, not an easy thing to come by in the world we live in now. I will definitely be more than happy to recommend you to my friends and family." "Yippee! We just got the marvelous sundial :)) A big big thank you for this wonderful piece of art. IT IS GORGEOUS :D I'll read the instructions mentioned and will send you the photos of the spectrum coming out of the very first Artisan Sundial in Adelaide..wow....feels terrific! Will highly recommend this beauty to all my friends in Australia." "Jim, the Spectra is absolutely gorgeous! One of the most amazing gifts I have ever given. Thank you so much for your outstanding service!" "Jim - all is good. Sundial is accurate to a few minutes and I suspect it will get better as we get away from the summer solistice. Very pleased and will highly recommend the Spectra." "We received the Spectra and we both love it. Thank you very much for the consistent contact and devotion to this gift which will be part of our home for years to come. I really do appreciate the hard work and care you put into it and it shows." "The Spectra has arrived and looks terrific! Thanks so much for getting it done in time for Christmas. I'll be having lunch with my friend tomorrow and will present it to him then. He'll love it. Thank you so much for your kind consideration and skill in making it so perfectly. It'll have a good home and I'll be back for more orders for friends and family." information. It now resides on our bedroom dresser in front of our window. It has been a pleasure doing business with you and knowing that there is such great energy attached to the sundial; you seem like an amazing man, really putting yourself into each piece you design. I'm so glad I stumbled upon your site." 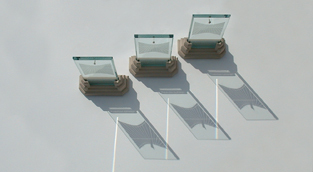 "The quality and workmanship of the Spectra Sundial was as advertised. Great care had been taken to make sure the dial came out flawless. Jim kept me posted of the different stages, as the sundial was being constructed, which almost made me feel like I was part of its creation. The Spectra Sundial should be part of everyone's family, and will be enjoyed and admired by all." "We received our sundial ("cadran solaire" in French) Friday last week, in perfect conditions. It is a beautiful piece of craftmanship which will find its place in our living room." "I am happy to tell you that my Spectra sundial has arrived this morning - and I am delighted with it - I am like a child at Christmas. I am particularly pleased that it arrived before the Winter Solstice. I put the Spectra in the sitting room window where I had taken the original measurements - it was spot on. The time was exact." "The Spectra arrived today and I must say it is more impressive than the pictures. Very high quality. Thanks for a fine work of art." "I watched my friend's face as he worked his way through the birthday wrapping paper, the sealed mailing box, the bubble wrap, down to your exquisite sundial. It was so very wonderful to see his eagerness to set the sundial up in the (thank goodness!!) brilliant sunshine we had yesterday. I was myself fascinated as we worked out how to set it up so it would tell the time with the very distinct shadow showing at 1 p.m. our time (otherwise, 12 noon Mountain Standard time). My friend registering the fact the dial shows Daylight Saving time, as well as his Spring Equinox birthday, was a real bonus. I can't thank you enough for creating such a wonderful birthday gift for me to give to my friend. It was something he never imagined. It is such a very lovely piece of work and I know it will be treasured and enjoyed all the sunny days in his future. Thank you for this gift to me - to help make my friend's 70th birthday so very special." "I received my Spectra today and it is really wonderful. Clearly you put a lot of work into it, and thought alot about the details. I like the sandblasted gnomon, and the way it is attached. I noticed how one edge rides on the equinox line, so it can be used to follow the declination of the sun. The base is handsome. It fits nicely in our sunroom, and I hope it will be a talking point for our guests. It is everything I hoped it would be, and more." "It has been a pleasure doing business with you, and it will be my pleasure to talk to people about this special gift. Everyone who already knows about it is intrigued. Your emphasis on quality and precision is rare in today's world and much appreciated. 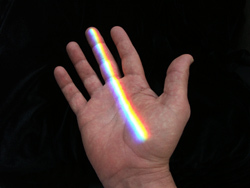 I was just visiting your web site again to look at the quotes, and saw the prism cast by the Spectra. I was struck by its beauty, and it brought to mind the opening line (chanted 7 times in a row) of the Yom Kippur service--on the Day of Atonement, the holiest day of the Jewish year. The Hebrew is transliterated as follows: Or zarua la-tzadik, u-l'yish-rey leyv simcha. It means: 'Light is sown for the righteous, and joy for the upright at heart.' How lovely that you are sowing light!" "A wonderful idea! I ordered a Spectra sundial as an anniversary gift for my wife, and had them include a special date line for our special day...and the shadow actually did hit the line on our anniversary! My wife thought I was so clever :-)"
"The dial looks very handsome...something beautiful and out of the ordinary. The spectrum line is a knockout! My Spectra will always be one of my most treasured possessions. You have made a family heirloom which will be passed down and probably fought over long after I am gone I think." "The Spectra sundial is truly a work of art. It is well made, solid as a rock, and elegant with its cut glass edges. It is perfectly calculated to tell my local time and I look forward to watching the shadow progress down the dial throughout the coming year." "I ordered a Spectra sundial from Artisan Industrials and it is very nice. Classically elegant and precise, custom made with my location printed right on it. It throws a lovely rainbow whenever we can get the sun to co-operate. Very good quality, hand crafted, professional. Sits perfectly in my South facing window, and I am surely the only kid on my block to have one." of such lasting beauty and elegance." "After searching for the 'perfect' gift to present our teacher, the students of the Kripalu Teacher Training found the site for the Spectra Sundial and we knew that our search ended there. Working with the artist Jim Tallman was an exceptional experience. He kept in communication throughout the creation of the Spectra and shipped it to us in a timely manner. Its simple elegance combined with the scientific complexities and the love it was created with made the Spectra Sundial the perfect gift for our teacher. He said that his yoga center has the perfect exposure for its display of prisms.....imagine what an inspiring yoga class that will be!! Thank you Jim for your contribution in making our graduation a truly spectacular occasion!"